Payment received for orders after the cut-off time will be processed on the next business day. Sunday and other state/central government holiday/strike/bandh/riots is a non-business day. *Delivery of stamp paper is done by thirty party (courier company), on best effort basis ONLY and can be delayed though very rarely due to situations that are beyond our control. Shipment can be returned back to shipper if address is incorrect/incomplete, consignee not available at the Shipping Address/door locked/No one to receive the shipment/Building Security not ready to receive the shipment. Hyderabad is home to some of the most beautiful architectural marvels that reflect the grandiose of the Nizams, with its rich culture and heritage. In the recent years, with the boom in the IT industry, the capital city of Hyderabad is growing rapidly. Stamp paper services are becoming highly prevalent and fast emerging in the newly formed state of Telangana, especially in the capital city of Hyderabad due to the overall development of the city in terms of infrastructure and development paving way to new job opportunities making more people migrate in search of jobs. 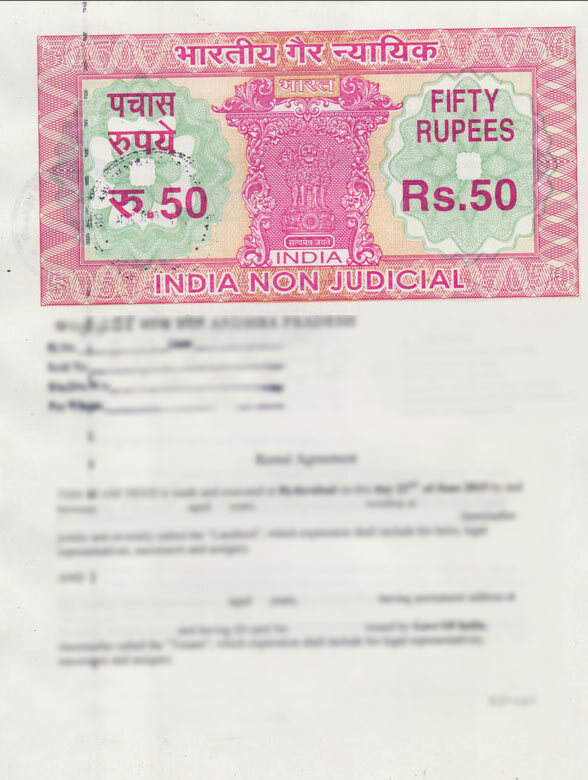 Traditionally people are dependent on conventional stamp papers for various legal agreements. Stamp duty needs to be paid on all documents that are registered. NotaryKart provides stamp paper writing if you need agreements, deeds to be printed on stamp paper in Hyderabad. When we receive your order online we procure stamp paper from stamp vendor whose details will appear on the stamp paper. Buy stamp paper online in Hyderabad at NotaryKart and we will ship them to your doorstep within 2-3 working days. We also deliver stamp paper on high priority to those who need in same day. Step 4: Finally get the stamp paper home delivered to your desired address. Stamp duty is paid when one is buying property like a house or flat in Hyderabad. Stamp duty needs to be paid on all documents that are registered for authenticity. Recently, the state government of Telangana has in principle agreed to reduce stamp duty on a property at Hyderabad. Stamp Duty is paid on instruments such as Agreement to Sell, Exchange of Property, Conveyance Deed, Partition Deed, Power of Attorney, Settlement, and Deed and Transfer of the Lease and many more. Why to choose NotaryKart to buy Stamp Paper Online? After 3 years of expertise and providing top class stamping services in the Silicon City of Bangalore, NotaryKart is extending its stamp paper services to the pearl city of Hyderabad. NotaryKart is offering stamp paper services online where you can place an order for stamp paper at Hyderabad at the click of a button by providing necessary credentials and the same will be delivered by courier within few working days. Just by visiting the portal, www.notarykart.com and entering the details for the stamp paper online, make an online payment and the stamp paper will be delivered to your mentioned address in the city of Hyderabad. NotaryKart enables multiple online payment options including Credit card, Debit Card, wallets, Internet Banking. Also, accept International credit cards for purchasing stamp papers online in Hyderabad. You don't need to stand in the queue or go in a busy traffic leaving your office work, wasting precious time and money, just order stamp paper online from NotaryKart and get same day or next day shipping to your doorstep. You can order stamp papers online in Hyderabad from the following areas like Hyderabad GPO, Head Post Offices at Khairatabad, S.R Nagar, Musheerabad Ghatkesar, Bowenpalli, Kukatpally, Malkajgiri, Hayatnagar, Ibrahimpatnam, Saroornagar, Uppal, Shalibanda, Stamp papers are sold in Secunderabad, Trimulgherry, Vikarabad, Station Kachiguda, Hyderabad Jubilee, Golconda, Gandhi Bhavan ,Banjara Hills, Chevelle, Medchal, Rajendranagar etc. and NotaryKart would deliver them to your doorstep within 2-3 working days. 1. What is meant by Stamp Duty? 2. What is the document for which stamp duty is required as prescribed by the State Government? The affidavit, adoption deed, sale deed, gift deed, lease deed, mortgage, license, partition deed and settlement deed etc. 3. What is the document for which stamp duty is required as prescribed by the Central Government? Central Government can fix stamp duty for a bill of exchange, Cheques, Promissory Note, Bill of Landing, Insurance Policy, Transfer of Shares etc. 4. When is the Stamp Duty to be paid? Generally, stamp duty shall be paid before or at the time of executing a document. 5. What is the time limit of stamp papers purchased? 6. Does paying Stamp Duty to vary from Instrument to Instrument? 7. What do you mean by ACC? ACC means Authorized Collection Center (ACC). It’s an agent appointed by SHCIL. ACC is the intermediary between the CRA and Stamp Duty payer. 8. Where to get stamp paper in Hyderabad? Stamp paper can be availed in Hyderabad at stamp vendor and also at the ACC centers of the Telangana state government where citizens can be able to get stamp papers. Or people who want to save their precious time and money can buy online by visiting www.notarykart.com to buy stamp paper in Hyderabad at ease.